Make your interior painting project easier with these helpful tips! Do you have an interior painting project in the near future? 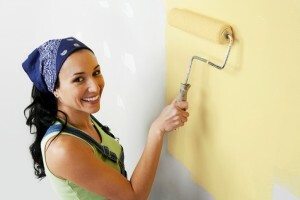 A freshly painted room will bring life and freshness into your home. If you know what you are doing, interior painting is not overly complicated. If you decide to not hire a professional and give it a go on your own, here are some tips to help you along the way! When it comes to interior painting, you definitely don’t want to be cheap with your painting supplies. The brushes and rollers you use for your interior painting project do not have to be top-of-the-line, but they should still be of good quality. There will be a considerable difference in your painting results if you don’t use good equipment. For example, cheap paint rollers are known to leave bubbles. Mistakes are bound to occur during interior painting. Since we know this to be true, it is smart to have a damp cloth on hand to fix any mistakes. You can use any unwanted cloth you have on hand. For example, an old sock will work really well for this. Have your damp cloth within reach when you are painting to protect yourself from mistakes. Are you tired of always needed to scrub out your paint trays once you have finished you paint project? If you are, why not invest in some paint liners for your paint trays? Once you are done painting, all you need to do is carefully take outliners and discard them. This will save you a lot of time and energy. Drips are inevitable on paint cans. There is simply no way around them. Since this is the case, it is a smart idea to place something under your open paint cans. It could be a piece of cardboard, an old towel, or some newspaper. You don’t want to rely solely on your drop cloth under your paint can. It will also make clean up a lot easier when you are finished painting because you can simply throw away whatever you used as a drip pan.